October 9, 2017 October 9, 2017 Dan O.
Marsha P. Johnson was a legend in the transgender world. She was loud, flamboyant, proud, and not afraid to speak her mind when it came time to. She wasn’t a revolutionary in the sense that she fought day and night for her community’s rights, as much as she stood side-by-side the many others who were there with her, hoping and wishing that one day, America would fess-up to realizing that transgender person’s rights matter. But sadly, Marsha’s life came to a tragic end when her body was found floating in the Hudson River. While nobody really had any clues just yet, the NYPD jumped on it real quick and determined that it was clearly the case of a “suicide”. Why? And with what evidence? Turns out, none. In fact, many years later, Marsha’s death is still a mystery and it’s one that old friend of Marsha’s, Victoria Cruz will spend the remainder of her days, invesitagating and uncovering as the tragedy that it was. And now we bring Native Americans into this situation! I’m a tad torn about Marsha P. Johnson, the movie, because while I agree with everything it says, presents and ultimately ends on, it also feels like a bit of a mess. On one hand, it’s this true-crime, murder-mystery tale of a botched investigation, conspiracies, and possible links to a mob. That right there is already interesting and more than enough to fill a whole movie. However, that’s not where it stops. Instead, we continue on to focus on, obviously, Marsha’s life. Then, we begin to focus on those who knew and loved Marsha, their trials and tribulations. Okay, fine. Then, we get a bunch of information about the gay-community leading up to Marsha’s death and how it was all being ran and funded by the mob. It’s a lot for one movie to take in and it’s why Marsha P. Johnson can’t help but feel like it’s got a tad too much on its plate. But then, at the center of it all, is this notion that Marsha’s life wasn’t just one, but many, many others who were just like her; sad, lonely, and confused, but fully in-love with herself regardless of the constant scrutiny she may have faced in her life. Director David France is able to cobble-up a lot of footage from Marsha, over the years and growing up, but really, it’s the fact that Marsha represents the lives of many transgender people in this country, as well as many others; like her, they too may not have the right time or place to actually come out and be themselves, so they wait patiently for that day to come. The 70’s did have a certain style to it. But when they do, do their lives get any better? Marsha P. Johnson is an emotional movie when it shows how much the LGBT community has suffered throughout the years and for literally no reason. It’s understandable to be enraged by this story and its overall outcome, which is probably the feeling France was going for. After all, this isn’t something that happens every so often – it’s nearly every day. It’s ridiculous, awful and yes, above all else, sad. When will it end, people? But like I said before, the movie’s heart and emotion is clearly here and it almost never goes away, even though it does falter and hide a bit here and there. This, though, has mostly to do with France’s busy direction and the overall fact that he doesn’t quite know how to stick with one angle or story-strand. His approach to this material is the same kind of crazy scattered-board that we see cops use to track down serial-killers who have been alluding them for way too long – it’s sort of all over-the-place, with one clear goal in the middle, but everything else connecting to it is just so darn much to take in and comprehend. But once again, it’s a story about the rights of a human being being violated. And why? I think we all unfortunately know the answer. So if anything, see it for Marsha and the countless other people just like her. They all deserve so much better than any of us can give them. 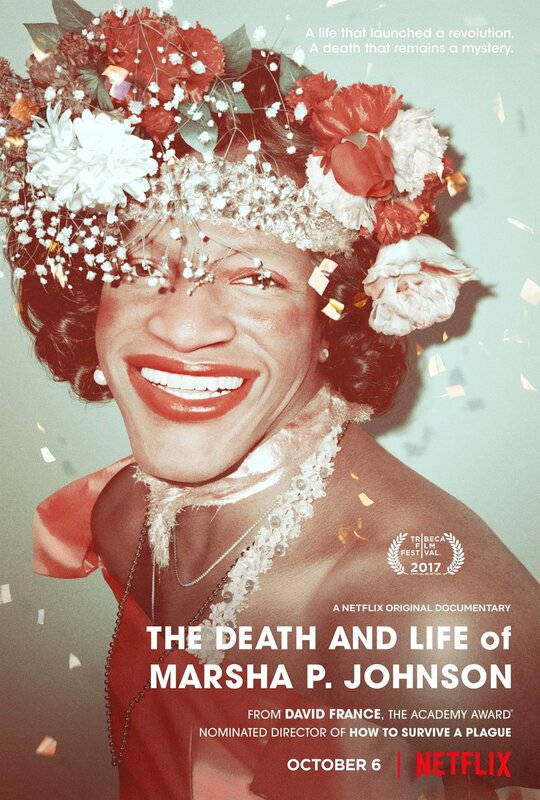 Consensus: While the direction may be a bit too sporadic, Marsha P. Johnson focuses in on its total subject and gives us a sad, but hopefully empowering tale. We’re sorry, Marsha. Rest in piece. Thanks for sharing your thoughts, I am eager to see this one..